When you double click on the Indigo 7 icon in the Applications folder, you're actually starting the Indigo Mac Client, which will start up the Indigo Server process according to the options selected in the Start Server dialog. 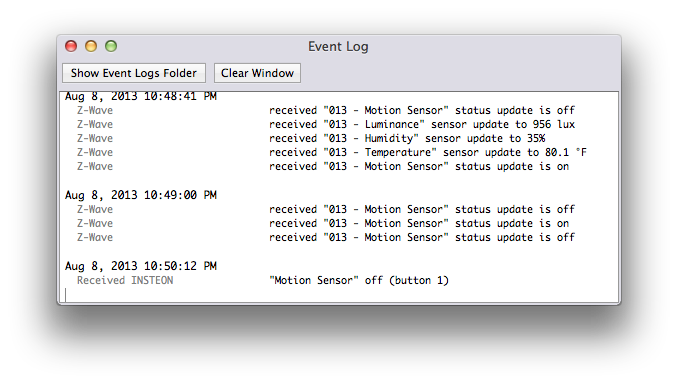 The outline view shows all high-level objects (except Variables which have their own window): Devices, Triggers, Schedules, Action Groups, and Control Pages. Selecting one of these in the outline view will switch the Item List to view all of those types of objects. The same goes for folders that are under the high-level headings except only the objects in those folders will show. To create a new folder, select the main object type in the list then click the plus (+) button at the lower-left corner of the outline view. A new folder will appear and you can just start typing it's new name. To delete a folder, select it, then click on the gear icon or right-click the folder (bring up the contextual menu). The resulting menu will allow you to select Delete Folder then delete it. If the folder isn't empty, it will show you a sheet with 3 options: Cancel (do nothing), Delete Items (delete the items in the folder along with the folder), or Move Items (move the items to the parent first then delete the folder). From the same menu, you can select Rename Folder… to rename it, Enable/Disable Remote Display (for devices, action groups, and control pages) to show/hide it in remote clients (like Indigo Web Server (IWS) pages or Indigo Touch), or copy the unique folder ID for use in Python scripts. To move an object to a folder, just drag it from the list view onto the folder (or top-level object) - somewhat like moving mail messages from the inbox to a mail folder in the Mail application. The Item List contains the items contained in the object that's selected in the Outline View - so if DEVICES is selected, then all devices in your system are shown. If you have one of the device folders selected, only the devices in that folder are shown. The buttons above the table view perform actions on items in the list - the buttons will work on whatever list is displayed in the Item List. So, if you have DEVICES (or a device folder) selected in the Outline View, the item list will show devices and the buttons will operate on that list - New… device, Edit… the selected device, Duplicate the selected device, or Delete the selected device(s). The search bar will filter the list. you can customize what columns are shown by checking/unchecking them in the list. Several of the columns have a checkbox in them - you can check/uncheck the feature for the object by clicking on the checkbox. In a few rare cases the checkbox will be disabled (grayed out). Take you to the How-To wiki for that device type - if it's a plugin device, it will take you to the help page supplied by the plugin developer. Toggle remote display - this tells Indigo whether to show the device in remote clients. Toggle communication with the device - this effectively enables/disables the device. If a device is disabled, it will show up gray in the list. Open a window that shows all other objects that are dependent on this device. See Deletion Dependencies for more information. Hide executions in the event log - they trigger will continue to execute but nothing will be reported in the Event Log window. 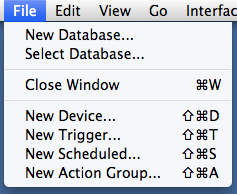 Open a window that shows all other objects that are dependent on this trigger/schedule. See Deletion Dependencies for more information. Open a window that shows all other objects that are dependent on this action group. See Deletion Dependencies for more information. Show in Browser - open the control page in the default browser. The item detail area shows controls and extra state information depending on what type of object is selected. The information in the tile will be specific to the device type. For instance, battery powered devices (that report their battery status) will show the battery level. For sensor devices, the sensor reading will show (temp, humidity, etc. for instance). All devices, regardless of type, will show Last Update - the last date/time that the device was changed in any way. Other device types will show specific control tiles based on their type as discussed below. If the device doesn't support dimming, those controls will be hidden. You'll also notice that in the Device Details tile, On State and Brightness (if it's a dimmer) will show the current values. Sensor devices have their own control tile as well. Some of those devices can be explicitly turned On and Off (thus the buttons) and can respond to status requests. The buttons will be enabled/disabled based on the device's capabilities. One thing to note about some battery powered devices: the Status Request button may be enabled because some of those devices have the option to be plugged in (for instance, the Aeotec MultiSensor) and will respond to status requests when plugged in but not when running on battery power. Also, some energy monitoring devices, such as the iMeter, keep running totals of energy usage that can be reset by the user. For those, a Reset button will be placed next to the Total Usage in the Device Details tile. Speed control devices are devices that can control the speed of some kind of motor. For instance, the INSTEON FanLinc. And, in fact, the controls are currently tailored to the FanLinc's High, Medium, Low, and Off settings. When we run across more of these types of devices we'll customize the controls appropriately. The sprinkler tile allows you to turn on a specific zone, go to the next or previous zone, update the valve status. And, if a schedule is currently running, pause/resume it, begin running the previous schedule, and stop all activity. The thermostat tile shows the current temperature, humidity, mode, cool/heat setpoints, and fan mode. You can also adjust all of those as well as refresh the values and turn everything off. Note that on rev2 thermostat adaptors the circles next to cool and heat setpoints will be lit if their respective HVAC system is actually running (A/C or heater). Output Controls tile shows the state of all the output states available for the device and you can update them immediately using the Send Status Request button. The button grid shows all available outputs and their status. Use the Turn Off All Outputs button to turn off all binary outputs. Enabled and Upload - this means that it will be processed both while Indigo Server is running and it will be uploaded to your standalone controller (if it supports uploading). Enable - this means that it will be processed while Indigo Server is running, and mirrors the Enabled column in the list if it's visible. 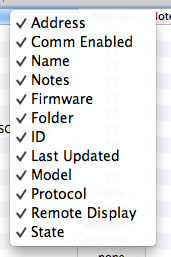 Disabled - this means that it's completely disabled - it also mirrors the Enabled column in the list if it's available. The Execute Actions Now button will do exactly that - execute all the actions associated with the object. NOTE: just as the triggering event will be ignored, so will any conditions associated with the object. The action group detail shows a list of all the actions in the group. The Execute Actions Now button will do exactly that - execute all the actions associated with the action group. The only thing in the detail area for a control page is the Show in Browser button, which will open the selected page in the default browser. The status bar along the bottom of the window has several elements. First, there's the communication queue indicator. It's the longish rectangle next to the Indigo icon. This indicator will show green bars going from right to left, and purple bars going from left to right. Green bars indicate outgoing communication purple bars show incoming communications. If you see green bars begin to build up, you can tell that something is keeping the outgoing command queue from processing correctly. Next to that bar you'll see the names of the interfaces you have configured. If they are in green, then they are functioning properly. If they are in red with a line through them, Indigo can't communicate with them. If they are gray, they are offline for some reason. The next four sets are pretty self explanatory: the next sunrise time, the next sunset time, the current time (for the Indigo Server, so it may be different than the client time if you're running the client on a different machine), and the next time a schedule is going to execute. The event log window shows you pretty much everything Indigo Server is doing at any given time. You see incoming and outgoing traffic, trigger and schedule executions, and other useful diagnostic information. 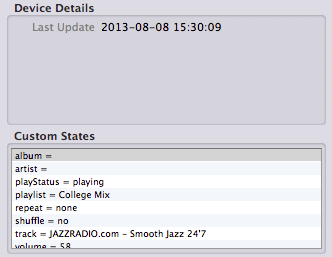 Click the Clear Window button to clear the log entries. 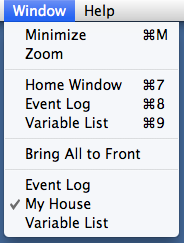 Click on Show Event Logs Folder to open the Logs folder in the Finder. Here you will find one file for each day's events. You can change how many day's worth of event log files are stored by selecting Indigo 7→Preferences… and then selecting the General tab. There, you can enter the number of days of event log files that you want to keep. Indigo Server will delete all files outside of that period of time. The variable window is discussed in the Variables overview section. In this section, we'll go through each of the menus in Indigo. The Edit menu has the standard options on it that you would expect any Mac app to have. Note that the Delete and Duplicate options are available for most items in the user interface. The View menu allows you to switch between views in the Home Window just as if you had clicked the major item types in the outline view: Devices, Triggers, Schedules, Action Groups and Control Pages. The Go menu may have some other options in it as well - if you're using a trial or Indigo Lite it will give you the option to enter new codes and to purchase a license. Help with Z-Wave networks… - opens a browser window to the help page for managing your Z-Wave Network. Remove Failed Modules from Controller… - use this menu item remove any Z-Wave nodes that may no longer exist on the network. Reset Z-Wave Interface… - use this menu to completely reset your Z-Wave interface. You should only do this if Indigo support instructs you to. 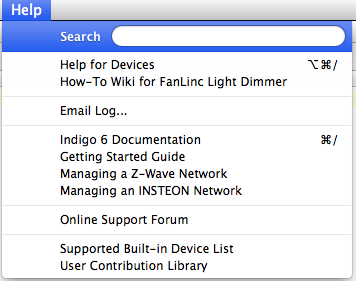 For Indigo Pro users, there are some other menu items added to this menu. 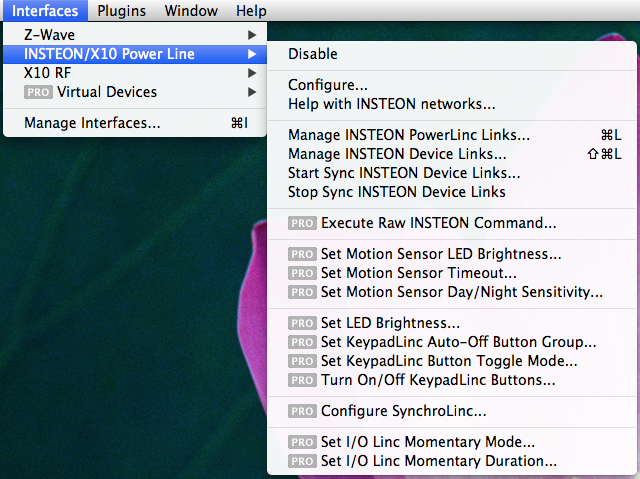 Those are described in the Managing Your INSTEON Network in Indigo document. Help with X10 RF Interfaces… - opens a browser to the documentation for configuring this type of interface. Help with Virtual Devices… - opens a browser window to the documentation page for Virtual Devices. Update Device Group Saved States… - will allow you to update the stored states for each device in the specified Device Group. Toggle Debugging - toggles debugging information in the Event Log on and off. Used primarily for technical support. Selecting the Interfaces→Manage Interfaces… menu item will open the interface preferences dialog. 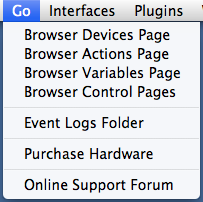 For information about the plugins, see the About… menu item for each plugin.